A gorgeous, romantic, absolutely wild revenge picture, Mandy is a downright achievement of psychotronic cinema. 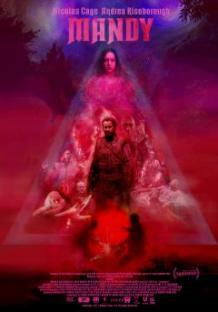 Director Panos Cosmatos (Beyond the Black Rainbow, an Original Princess premiere in 2010) and co-writer Aaron Stewart-Ahn send the great Nicolas Cage on a quest that will take him far past hell. Red (Cage) and Mandy (Andrea Riseborough, Battle of the Sexes) were happy together, until the night a band of murderous cultists led by one Jeremiah Sand (Linus Roache, Priest) invaded their home and destroyed the life they had built together. Red, left alive, forges an axe and sets out to see the cult answers for what they've done.